Click here to read all my TFW posts. Cautious remarks within September’s full-year statement and November’s AGM update had already suggested TFW’s first-half progress would not be that spectacular. As it turned out, this H1 statement did in fact show record revenue and profit — albeit only just. The top line improved 4% while reported operating profit climbed 1%. I guess TRT’s “excellent order book” did not translate into an excellent financial performance for this first half. More than a quarter of TFW’s 2017 revenue was generated in Europe, and a quick check on the GBP:EUR exchange rate does not suggest currency movements had a significant effect during this H1. At least moves are afoot to rekindle the growth rate. Product development “continues apace”, useful acquisitions have been located while plans for a new European showroom — similar to the impressive set-up within the group’s Redditch HQ — are underway. I could not find anything untoward within TFW’s cash flow statement. Favourable working-capital movements and relatively modest capex helped produce free cash flow of £6.6m and fund an initial £5.9m acquisition payment. I calculate TFW’s cash — plus the group’s eclectic mix of property, loan notes and investments — now stands at £51m, or 44p per share. Earlier accounts indicate the bulk of the liability relates to the earn-out involved with the 2015 Lightronics acquisition. “In December 2017, the Group acquired 100% of the share capital of Famostar B.V., an emergency lighting specialist in the Netherlands. The company was acquired by Lightronics Participaties B.V. for an initial consideration of €7.6m (circa £6.8m) with an estimated additional €0.5m (£0.4m) payable subject to performance conditions relating to EBITDA in 2017 and 2018. So that explains some of the liability’s increase. I suspect the rest of the increase has been counterbalanced by other accounting movements, but I will have to keep watch on this growing liability just in case. 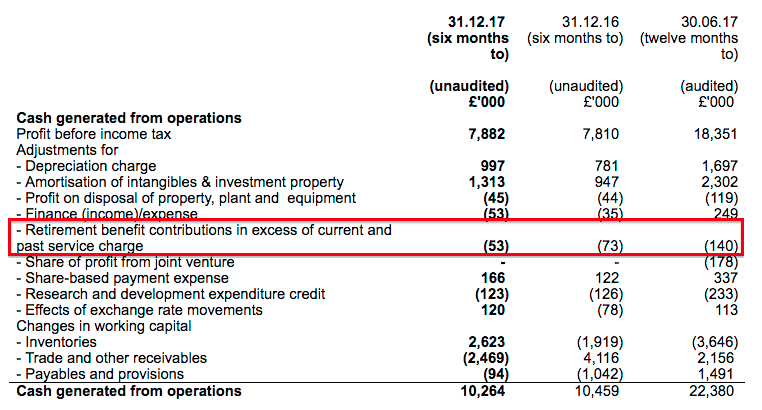 Subtracting the ‘other payables’ liability from the £51m cash/investment hoard gives a net cash/investment position of almost £40m, or 34p per share. I am also pleased the group operating margin remains a respectable 15%, and that the main Thorlux division enjoys a healthy 18% margin. 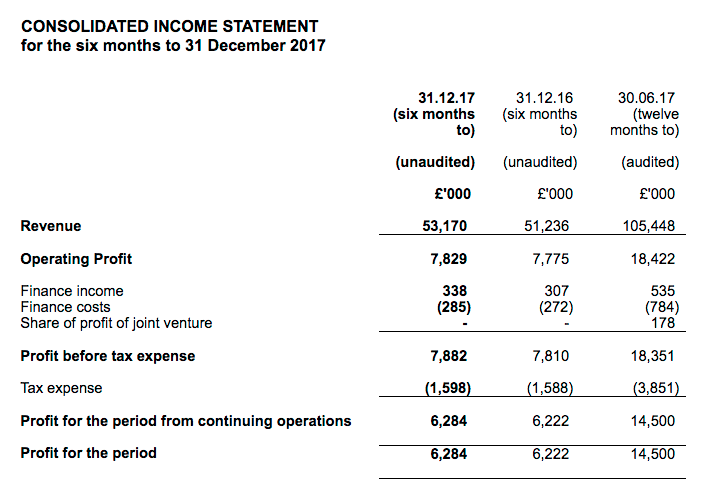 Operating profit for the year ending December 2017 was £18.5m and, after applying the 20% tax seen in this H1 statement, earnings come to about £14.8m or 12.8p per share. Adjusting the present £365m market cap (at 315p) for the group’s net cash, investments and those ‘other payables’, I come to an enterprise value (EV) of £325m or 281p per share. Dividing that 281p per share EV figure by my 12.8p earnings guess gives a trailing P/E of 22. I have to admit, a 22x rating does look racy for a business that has just reported 1% profit growth. Were the standstill earnings performance to extend into the next financial year, the share price could face a significant risk of de-rating. Nonetheless, I don’t get the impression TFW’s bumper 2013-2017 period was a complete growth ‘fluke’. As such, I am hopeful that management’s “vision of stable long-term growth” can soon re-emerge within the accounts. What’s more, my seven-plus years as a TFW shareholder have told me it has generally paid to back this conservatively run business — rather than worry too much about near-term earnings and immediate valuations. Those seven-plus years have also told me not to expect too much as a dividend. The interim payout was lifted 4% to 1.4p per share, and the trailing 4.95p per share dividend is now covered a very generous 2.6x by my latest earnings guess — and 7x by the cash/investment hoard. It all means the yield at 315p is a lowly 1.6%.